We are engaged in catering to the diversified demands of the customers by putting forth an array of Lined Flexible Hose Pipe. The raw material required for the fabrication of the range is sourced from the coherent vendors of the industry. Available in a plethora of dimensions, sizes and specifications, the range is appreciated for light-weight, easy installation and reliable performance. We are offering our customers Lined Flexible PTFE Hose Pipe that are emerging to be the most preferential choice of our clients for ensuring that their lab works go flawless. Preferred for their features of durability, high tensile strength and corrosion resistance, these superior quality pipes are made of best quality raw material. The size specifications of these pipes is predefined and clients can avail them as per their requirements as well. Its prominent suitable medium is acidic substances. We have been able to provide the customers with optimum grade PTFE Lined Hose Pipe. Fabricated using premium quality PTFE, liners and advanced technology, the range is widely used in varied chemical and high purity applications. Available in varied sizes & specifications, the range can also be obtained in customized specifications, as per the clients' requirements. 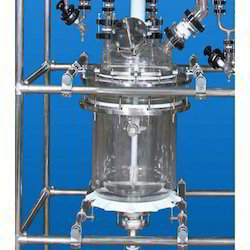 We have in store optimum quality Distillation Assembly On Glass Lined Reactors. The offered assemblies is made using quality tested raw material, sourced from vendors of high repute. Owing to which these assemblies ensure optimum performance, dimensional accuracy and durability.